Breeding (March to May): Temporary pools, shallow wetlands, and shallow parts of lakes; always near woodlands. Summer (May to ?? ): Grasslands and fields near trees, forest edges, urban areas; all with wetlands nearby. 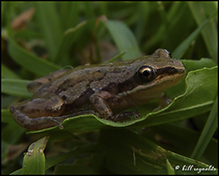 This is one of the smallest frogs in Minnesota, ¾″ to 17 ⁄16″long at maturity. Females are larger than males. The body is long and slender. The background color of the upperside is a gradation from a lighter to a darker color; usually tan to brown or reddish-brown, or green to gray. The belly is light brown or cream colored and unmarked. There are three narrow, longitudinal, irregular, stripes of a darker color down the back. The stripes may be more or less broken into a row of spots. Another dark stripe runs from the snout, through the eye, and down the side of the body. The upper lip is white. The male has a dark throat sac. The legs are short relative to the body. The toe pads are tiny. Spring peeper (Pseudacris crucifer) has dark markings on the back that form a distinctive "X" shape. Adults overwinter, partially frozen, beneath rocks or logs. They emerge in late March or early April, often while snow and ice are still present. Males call to attract females. Breeding begins immediately and is usually complete by June 1. The female lays small round clusters of 20 to 300 eggs, eventually laying up to 2,500 eggs, on submerged plants. The eggs hatch in 3 to 14 days, and tadpoles transform into adults in 50 to 70 days, depending on the temperature of the water. They live 3 to 5 years. Males continue to call in June and July, after the breeding season. 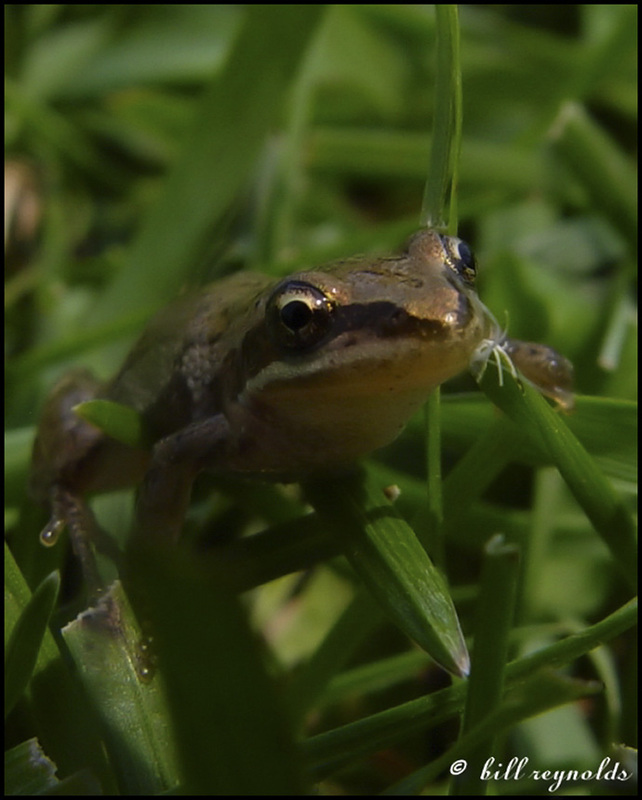 With their short legs these frogs are not very acrobatic and do not climb well. Sources: 6, 7, 11, 12, 24, 29, 73. This species has been recorded in every county in Minnesota. 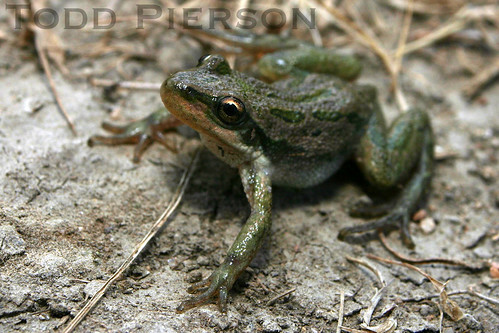 This species was formerly classified as (Pseudacris triseriata maculata), a subspecies of western chorus frog (Pseudacris triseriata). 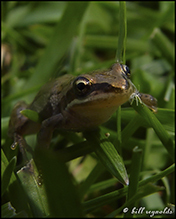 Male Boreal Chorus Frogs (Pseudacris maculata) begin to sing when ambient temperatures finally bump-up beyond the mid-sixties. Photographed at the Turtle River State Park, North Dakota (07 May 2013). Thanks to Laci Prucinsky for making me aware of the species-level taxonomic change for this small anuran! Sounds of calling Boreal Chorus Frogs (Pseudacris maculata) on Lake Superior. These little guys are all over my yard lately.